I recently joined a Tribe of dear sisters who meet twice a week on video conferencing. I often thought I didn’t need to join one of these online fitness groups since I can hike, and go to yoga… yet the reality is I get busy, life gets full and my health sometimes takes a backseat. Tysan and Zenon are a wealth of knowledge and there is so much to learn about or bodies and how to release old patterns we might be holding onto. 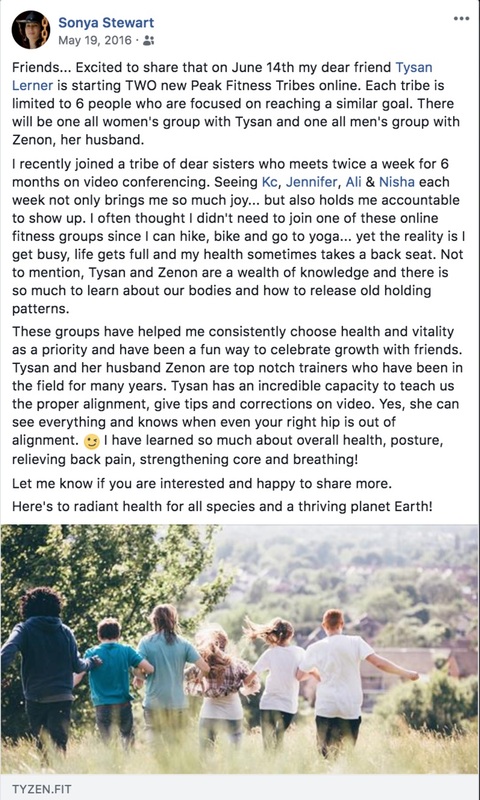 These groups have helped me consistently choose health and vitality as priority and been a fun way to celebrate growth with friends. Tysan and her husband Zenon are top notch trainers who have been in the field for many years. Tysan has an incredible capacity to teach us the proper alignment, give tips and corrections on video. Yes, she can see everything and knows even when your right hip is out of alignment. I have learned so much about overall health, posture, relieving back pain, strengthening core and breathing!